LAS VEGAS – Many believe that Timothy Bradley's victory over Manny Pacquiao in their June 9 bout for the World Boxing Organization welterweight title was a robbery, but the Nevada attorney general said Tuesday it was not a crime. Catherine Cortez Masto, the Nevada attorney general, wrote in a letter to Top Rank's Bob Arum that "there do not appear to be any facts or evidence to indicate that a criminal violation occurred." That pleased Bradley manager Cameron Dunkin, who said, "I'm not surprised at all." However, it did little to soothe the feelings of Arum, who in the immediate aftermath of the majority decision favoring Bradley was blamed by the public for somehow influencing the result. Arum said he didn't think the inquiry, conducted by Dale Liebherr, the attorney general's chief of investigations, was thorough enough. He sent a letter to Cortez Masto on June 11 requesting the result be investigated to clear his name and with the hope it would restore public confidence in boxing. Not interviewing judges Jerry Roth, C.J. Ross and Duane Ford was a mistake, Arum said. "I have no reaction to it," Arum said. "They spent a lot of time interviewing the referee [Robert Byrd] who had nothing to do with judging the fight, and I didn't see any interviews with the three judges who scored it? Wouldn't you do that if you were looking into it?" Ross and Ford each scored the bout 115-113 in favor of Bradley, while Roth had it 115-113 for Pacquiao. 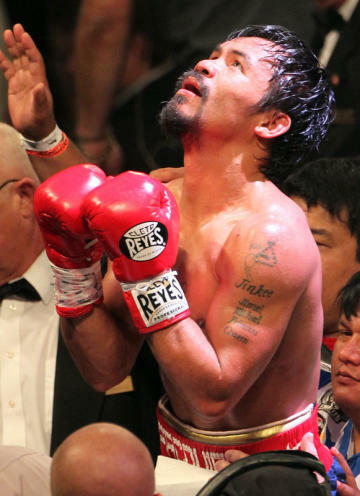 The overwhelming consensus of fans and media who saw the fight was that Pacquiao won handily. Cortez Masto wrote that the judges were experienced and had the qualifications to officiate a match of the magnitude of Pacquiao-Bradley. She noted that all procedures were followed in selecting the officials. "Displeasure with the subjective decisions of sporting officials is not a sufficient basis for this office to initiate a criminal investigation," Cortez Masto wrote. "Unless evidence beyond mere displeasure if forthcoming, this matter will be considered closed. While there may be strong disagreement with the decision, the exercise of professional judgment by individuals officiating at a sporting event is not by itself a criminal violation." Arum, though, said Liebherr could not have determined whether or not a crime was committed if he did not interview the judges who scored the fight. He was happy that Cortez Masto wrote that there was no evidence of criminal wrongdoing, but was unhappy it wasn't a more definitive answer. "Anybody who reads that letter is going to say, 'Hey wait a second. The three people who, in effect, caused this, why weren't they interviewed?' Obviously, it would have been far more thorough had they interviewed the judges. They probably would have come to the same conclusion [that there was no evidence of a crime], but at least they would have talked to the people at the center of the issue." Dunkin said he hoped the letter would make life easier for Bradley, who has been subjected to abuse by angry fans. "Nothing did happen, no funny business at all, and I'm not surprised that's what [Cortez Masto] found," Dunkin said. "I expected this. I'm happy they cleared it up, and for all the paranoid people who don't understand and who don't know what they're talking about, now they can calm down."